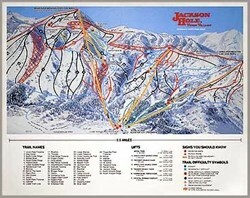 Jackson Ski Area Map Poster represents the way the Jackson Hole Ski area was over 20 years ago. 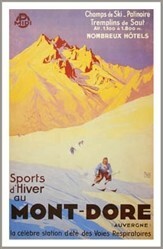 It is a great gift and keepsake for those you have skied the great mountains of Jackson Hole in the years gone by. 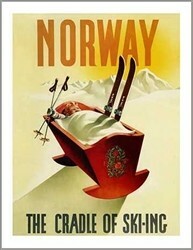 Great addition to any ski wall decor too! 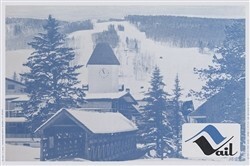 Presently Jackson Hole has 2,500 acres of legendary inbounds terrain, a 4,139′ vertical rise, 459″ of average snowfall each winter, and unparalleled backcountry access, Jackson Hole offers a truly unique winter experience. Two distinct mountains in the heart of the Tetons – Rendezvous and Apres Vous – make up Jackson Hole Mountain Resort and have been home to incredible skiing and snowboarding for the past 40 years. Whether you’re here to experience “The Big One’s” wild, untamed terrain, rolling, wide-open groomers, or you’re just getting out on the snow for the first time, it’s bound to be an experience you’ll never forget. Visit the Million Dollar Cowboy Bar for the real taste of Jackson Hole! Poster Size: 22 x 28 inches.